Locked in a close game for the first time in weeks, Baylor never flinched. 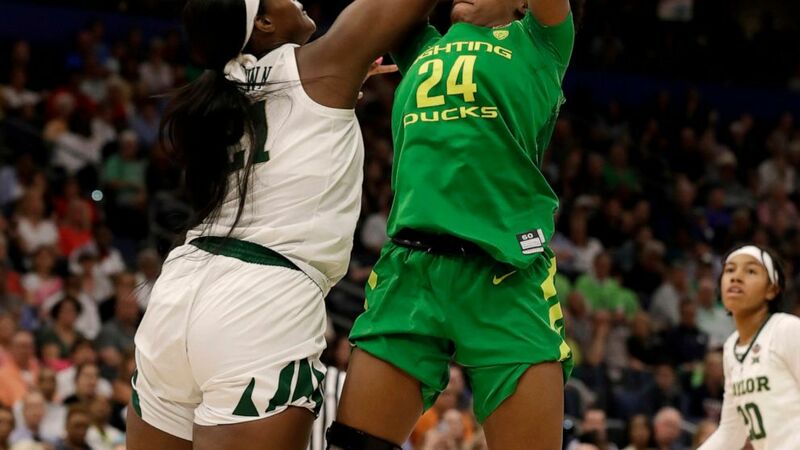 Kalani Brown scored 22 points and Lauren Cox added 21 as the Lady Bears (36-1) held off Final Four newcomer Oregon 72-67 Friday night to reach the women's championship game for the first time since 2012. "The feeling is unreal," Brown said. The 56-year-old coach, in her 19th season at Baylor, said she never questioned how her team, who's played only a handful of games decided by fewer than 10 points, would respond when they fell behind 64-61 with just over six minutes remaining. "There was nothing to draw up. No magical words," Mulkey said. "Just go play." All-American Sabrina Ionescu led Oregon (33-5) with 18 points, but didn't score in the fourth quarter. She missed a layup that would have given her team the lead in the final minute and the Ducks misfired on 12 of their last 13 shots. "They played like champions today and deserve to move on," Oregon coach Kelly Graves said. "I'm really proud of our team, no question about it. We certainly belonged to be here," Graves added. "We had our chances down the stretch. I just don't know if we ever got our game going. We saw bits and pieces of it here and there. Credit them. A really good defensive team." "I think this is just going to make us more hungry to get back to this stage," Ionescu said. The opening semifinal at sold-out Amalie Arena was billed as "old school" vs. "new school" — a matchup of contrasting styles, with Baylor hoping to exploit a size advantage inside with an imposing frontcourt of the 6-foot-7 Brown and 6-4 Cox and Oregon looking to test the Lady Bears' ability to defend the 3-point line. Ionescu shrugged off a scoreless first quarter in which she attempted just two shots. She scored 12 in the second quarter and gave Oregon a 34-33 halftime lead after making a long 3 while being bumped to the ground by Baylor's DiDi Richards. "Our practices prepare us for these moments," Mulkey said after Baylor's closest game since a 74-68 win at Texas on Feb. 4. Graves said the Ducks don't take solace in playing the top overall seed down to the wire. "No, it still hurts," the coach said. "But we'll have a chance to look back on this and realize that this was an incredible season. We've got a lot coming back. This is a team that's going to be loaded. ... We've proven we're a program on the rise. We're not going anywhere." The only basket Oregon scored over the final six minutes was Satou Sabally's 3-pointer that tied it at 67. Asked during a postgame news conference if she's made a decision about her future, Ionescu responded with a single word: "No."